Brain science: Great articles about experimental neuroscience, conjoined brains, and everlasting consciousness. Experimental neuroscience, conjoined brains, and everlasting consciousness. 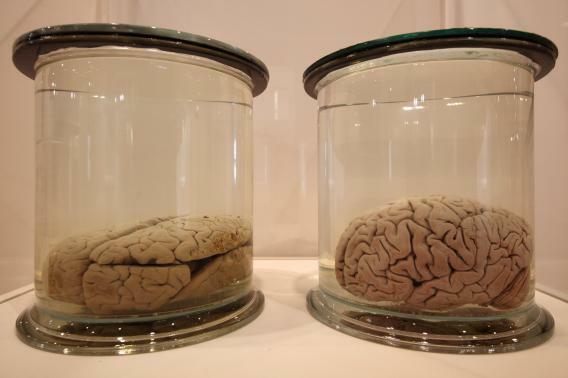 Preserved brains are displayed at the new ‘Brains’ exhibition at the Wellcome Collection on March 27, 2012 in London, England. When a neurosurgeon cut in to Henry Molaison’s brain in 1953, his life changed forever. So would everything that science ever knew about memory. On the shared life of Tatiana and Krista Hogan. What the sensation of an uncontrollable itch can tell us about how the brain operates. How some scientists are turning to connectomes—maps of the brain’s neural circuitry—to make the case for brain preservation, mind uploading, and eternal life. “Hayworth takes this theory a few steps further. He looks at the growth of connectomics—especially advances in brain preservation, tissue imaging, and computer simulations of neural networks—and sees something else: a cure for death. Should the discovery of a brain disease or disorder excuse a person from prosecution? How recent advancements in brain science are changing understandings of volition. “As our understanding of the human brain improves, juries are increasingly challenged with these sorts of questions. When a criminal stands in front of the judge’s bench today, the legal system wants to know whether he is blameworthy. Was it his fault, or his biology’s fault? How a radical surgery intended to separate the right hemisphere of the brain from the left impacted both researchers and patients. “But what Vicki could never have known was that her surgery would turn her into an accidental superstar of neuroscience. She is one of fewer than a dozen ‘split-brain’ patients, whose brains and behaviours have been subject to countless hours of experiments, hundreds of scientific papers, and references in just about every psychology textbook of the past generation. And now their numbers are dwindling. “When I spoke to Nick’s parents, they still had trouble with the notion that, to become a donor, it was not enough for their son to die with his body more or less intact. He would have to have the right kind of death, with the systems in his body shutting down in a particular order. ‘I’m so confused about this part of it,’ his mother said. ‘I don’t understand why, if his heart stops beating, they can’t put him back on a respirator.” Rick, too, was confused about the moment at which “the plug will be pulled.’ In reality, there is no moment when the plug is pulled; to keep the organs viable, the respirator is left operating—and the heart keeps beating—until the surgeon removes the organs.